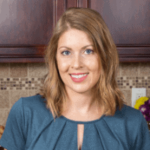 Published: Feb 7, 2019 · Modified: Apr 11, 2019 · By Jen Sobjack · This post may contain affiliate links. 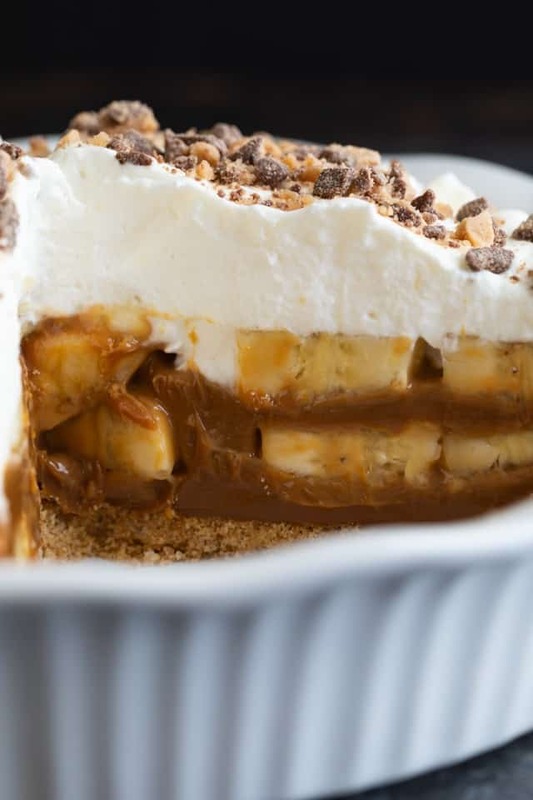 The most epic Banoffee Pie you’ll ever try! 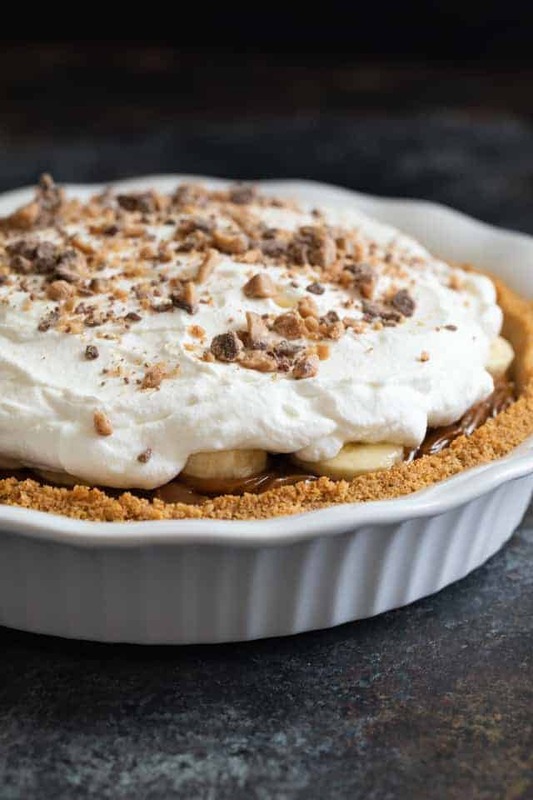 A thick graham cracker crust is filled with dulce de leche and bananas, then topped with whipped cream and toffee bits. Did I mention this recipe is incredibly easy?! I just love bananas and all things made with bananas! If you hand me banana cream pie, banana bread, banana cake, or banana bran muffins, I won’t complain at all. I’m especially fond of banoffee pie! It’s an English dessert made with bananas, toffee, and whipped cream. And of course, it gets its name from the combination of bananas and toffee. Banoffee = banana + toffee. But it’s also referred to as banoffi. You’re going to love my version of banoffee pie! I used my favorite graham cracker crust recipe, the one from my key lime cheesecake pie. And layered it with dulce de leche and bananas. You can make your own dulce de leche by slowly heating milk and sugar until it caramelizes into a soft, gooey texture. Or you can slow cook a can of sweetened condensed milk which is one the most popular methods. But I made this recipe supremely easy for you! You don’t need to make the dulce de leche, just buy it. It comes in a can and is found in the Hispanic aisle at the grocery store. 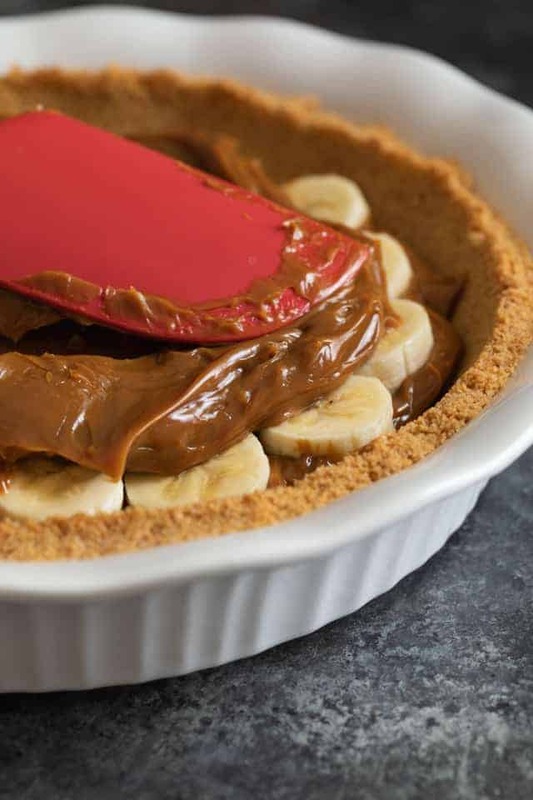 You’ll need to use a deep dish pie plate because the filling contains two cans of dulce de leche and 3-4 bananas. Most recipes call for a single layer of toffee topped with bananas but we are doubling this. This is one EPIC pie! The whipped cream is made from scratch or you can use store-bought if you wish. And the cream is topped with Health toffee bits which can be found in the baking aisle at the grocery store. I know most Walmart stores carry it. There’s not really much to making a banoffee pie. The crust is simple, the filling is even simpler, and the topping is all too easy. Give it a go and tell me what you think! 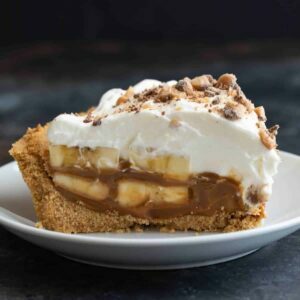 How to make banoffee pie? Begin by preparing the crust. Mix graham cracker crumbs, sugar, and melted butter together until the mixture looks like wet sand. Press it into a 9.5-inch pie plate and bake it for 10 minutes. Let the crust cool completely then pop it in the refrigerator for 30 minutes. This is double insurance that it won’t crumble apart while you load it with filling. 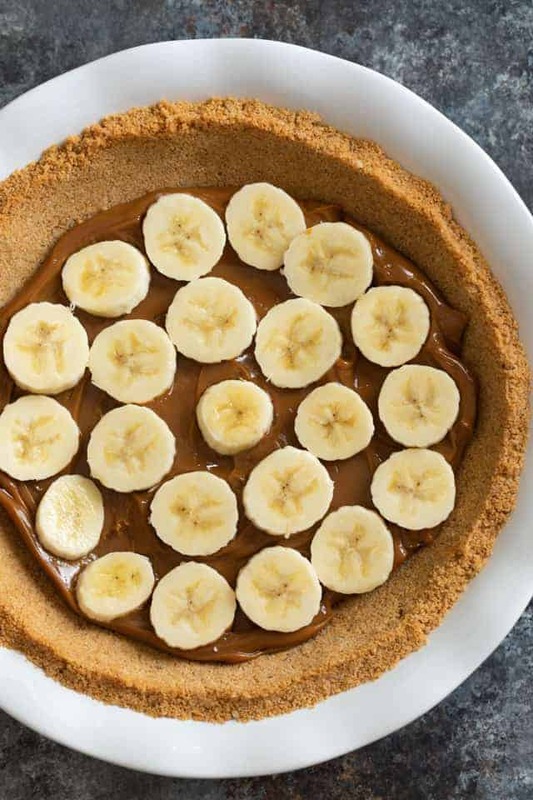 Carefully spread one can of dulce de leche into the bottom of the crust and arrange a single layer of banana slices over the top. Repeat the layering with the remaining dulce de leche and bananas. You may need 3 or 4 bananas depending on how large they are. Beat heavy cream, confectioners’ sugar, and vanilla to soft peaks and spread it over the filling. Place the pie in the refrigerator for at least 3 hours. Then just before serving, sprinkle toffee bits over the top. 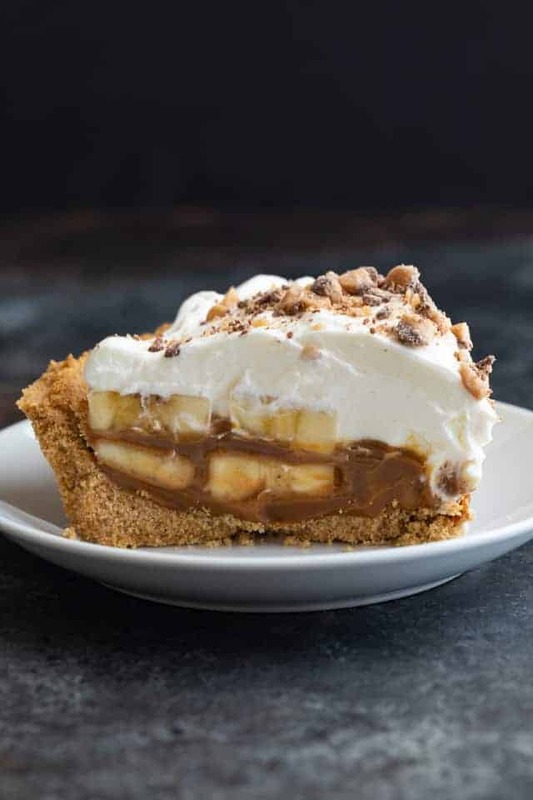 How to keep bananas from browning in banoffee pie? Bananas are notorious for oxidizing after they’ve been sliced. You can prevent this from happening by drizzling a little lemon juice over them before you add them to the pie. Use just a small amount of juice and gently stir the bananas to get them well coated. Orange juice will also work and doesn’t taste sour. How do I keep my whipped cream from separating after refrigeration? Whipped cream is deliciously creamy and it’s the best topping banoffee pie. But, if you need to refrigerate leftover pie, the whipped cream can begin to break down. It’ll start leaking runny cream down into the pie. To counteract this, use a stabilized whipped cream instead. Stabilized whipped cream will hold up much longer and should keep for 2-3 days. In a medium mixing bowl, combine the graham cracker crumbs, sugar, and melted butter. Stir until the crumbs are evenly moistened. Tightly press the crumb mixture into the bottom and up the sides of a 9-inch pie pan. Bake for 10 minutes. Set aside to cool completely then refrigerate for 30 minutes. Using a silicone spatula, carefully spread one can of dulce de leche into the bottom of the prepared crust. In a medium bowl, beat the cream, sugar, piping gel, and vanilla together with an electric mixer on medium speed until the sugar has dissolved and the mixture is foamy. Turn the speed up to medium-high and beat until soft to medium peaks form, about 3-4 minutes. Take care to not overbeat! Spread the whipped cream over the bananas and refrigerate uncovered for at least 3 hours. Garnish with toffee bits before serving. The pie will keep for up to 4 days stored uncovered in the refrigerator. The baked crust can be covered tightly and stored in the refrigerator for up to 2 days or frozen for up to 3 months. Thaw overnight in the refrigerator. The fully assembled pie can be made up to 1 day in advance. Store in the refrigerator uncovered until ready to serve. *You can find cans of dulce de leche in the Hispanic aisle of the grocery store. Or you can learn how to make it at home. **Lemon or orange juice is helpful if you plan to make the pie ahead of time. The juice will prevent the bananas from browning. ***Piping gel is used to make stabilized whipped cream. The whipped cream will hold up longer without separating which is useful if the pie won’t be fully consumed in 1 day. I make banoffee pie all the time! It’s my families favorite! !